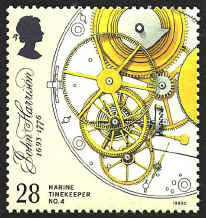 In 1714 the English Parliament offered a £20,000 prize for a time keeper that was accurate to half a degree. 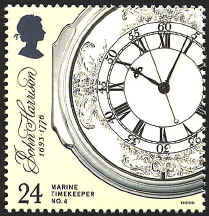 The story of the development of the marine chronometer by John Harrison is told by Dava Sobel in Longitude (Walker and Co., 1995). 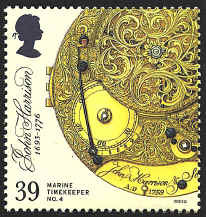 Over a period of twenty-six years Harrison built four clocks. 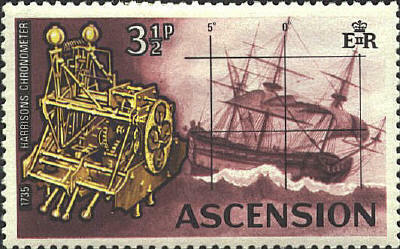 Harrison's Number 1 is pictured on the stamp from Ascension. In 1765 the sea trials of Number 4 produced an error of less than one tenth of a second per day. 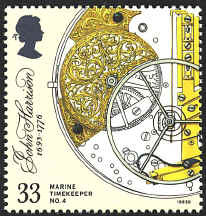 The British stamps show various views of the works of Harrison's Number 4. Now the longitude could be determined with an error of less than a tenth of a mile at the equator.